India -US Intelligence Halt: Secrets Choked? Indo-US intelligence sharing is a misnomer. It's a one-way street. 4. The US does not wish to upset Pakistan. As a result intelligence inputs on cross- border terrorism is near-zero. 5. The non-cooperation is now mutual. India is also reluctant to share information. Four months ago, Vice Admiral Mike McConnell, director of US National Intelligence (DNI), called on India's national security advisor (NSA) M.K. Narayanan at his South Block office in New Delhi. McConnell, a key figure in the current reshaping of American intelligence, said he was keen to see greater cooperation between India and the US in the global war against terror. But the NSA said there was a problem. According to senior officials familiar with what transpired at the meeting, Narayanan did some plainspeaking, telling McConnell that America's tacit support to Indian agents defecting to the US, like Rabinder Singh, a joint secretary in RAW, was straining the relationship. He then referred to recent cases of leakage of sensitive information from the National Security Council Secretariat (NSCS), allegedly engineered by US intelligence operative identified as Roseanne Minchew. The NSA also told the US DNI that the quality and quantum of intelligence being shared by the US with India was not substantive enough. Sources said McConnell claimed ignorance and assured Narayanan that he would "look into" the issues raised at the meeting. While India has been apprehensive about suspected US attempts to penetrate Indian intelligence, there are equally serious concerns about intelligence sharing. With intelligence inflows from the US down to a trickle, India is no longer as cooperative as it once was. As a source put it, "The Americans seem to have little to share in the joint working group. On the other hand, other countries have proved to be more helpful." He was referring to the mutually beneficial intelligence-sharing mechanism with the UK, Israel, Germany and Canada. One area where the Indians feel they have been shortchanged by the US is in the investigation into the hijacking of the IC-814 to Kandahar. While some of the accused in the case have been awarded a life sentence after the CBI investigation, the FBI is yet to conclude its probe. Admits CBI director Vijay Shanker: "The most intriguing aspect of the hijack case has been the stand of the Federal Bureau of Investigation, which registered its own case after the Kandahar hijack due to the presence of a US citizen, Jeanne Moore, on board the aircraft. The FBI was extended all possible help by the CBI and yet its own role can only be described as a major disappointment for us." By help, Shanker is alluding to how India facilitated over half-a-dozen visits by FBI teams to the high-security jail in Patiala to directly interrogate the accused. The FBI was also given free access to the CBI's investigation team, as well as all the evidence it had accumulated. Indian intelligence handed over communication intercepts, details of passports issued by Pakistani authorities to the hijackers and names of co-conspirators who are still present in Pakistan. But the Americans are yet to reciprocate to this quality of cooperation. Intelligence officials attribute this to American sensitivity to pressure from Pakistan. In short, a desire to avoid doing anything that could expose the ISI's hand in the hijacking. India had hoped to access details of terrorist networks operating in Pakistan from the Americans. But little has been forthcoming. Most of the intelligence shared so far has been in the shape of communication intercepts which, officials say, India taps through other sources in any case. "Once in a while the CIA shares intercepts collected from their stations in Peshawar and other places, but these can be accessed by our own technical assets," a senior source told Outlook. New Delhi is also unhappy with Washington's lack of cooperation in Afghanistan, a key area of interest. However, to be fair to the US, RAW can also be blamed for ignoring Kabul. 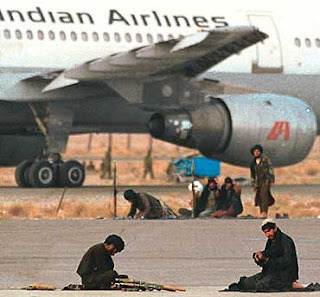 Right from the days of the IC-814 hijacking, when Indian intelligence had no assets in Afghanistan, India realised the need to build its network in the war-torn country. However, little was done and the RAW officials posted there were of suspect capabilities. That said, it is a fact that the US has a massive intelligence presence in Afghanistan, both in terms of technical and human intelligence. They also have several assets inside Pakistan, including in key regions such as Peshawar. But the US focus has been on the Al Qaeda and the Taliban rather than terrorism related to Kashmir. "Our contention has been that the networks of terrorists in Kashmir are the same as the Al Qaeda and Taliban. But the Americans seem to be conveniently ignoring this," a source said. A key reason for US hesitation in sharing intelligence with India vis-a-vis cross-border terrorism has to do with its position on Pakistan. atomic secrets to Iran and other countries. The Pakistan navy is playing a key role in the Coalition Maritime Campaign Plan (or CMCP, the naval arm of Operation Enduring Freedom in Afghanistan and Iraq) and was even appointed leader of the coalition, with a Pakistani Rear Admiral heading it." Islamabad annually receives $5.3 billion worth of military aid from the US for participating in the war against terror. According to the source, with such a lot invested in the ties, the US would not like to upset its ally. Which is perhaps why it is reluctant to part with information that would cause discomfiture in Pakistan. When contacted, a US embassy spokesperson in New Delhi told Outlook, "We never comment on matters pertaining to intelligence, but this aspect of the bilateral relationship is quite satisfactory." Interestingly, the present lack of cooperation between the two nations is in stark contrast to the immediate post-9/11 period, when there was both intelligence sharing as well as training programmes. Indian intelligence inputs on threats to the life of President George W. Bush was appreciated by the US. Over the years, director-level officers from RAW have been trained in the US. America, say sources, was keen to expand the ambit of training programmes, provided RAW adopted a broader canvas to recruit intelligence officials on merit and aptitude. However, India is not ready to change its traditional recruitment policy of selecting candidates through the Union Public Service Commission route. So, will there be an opening up of the currently clogged intelligence-sharing channels? The Indian side is optimistic, given that Washington has been highlighting the Indo-US nuclear deal as its commitment to growing bilateral ties.Also, according to the "500-day (reform) plan" scripted by McConnell, building fruitful partnerships will be the key aim of the US intelligence community.